An atresia is a complete obstruction of the lumen of a hollow viscus. Duodenal atresia is a congenital defect of the gastrointestinal tract characterized by the complete absence of the lumen of the duodenum (the first part of the small intestine). This makes the absorption and passage of food through the digestive canal impossible, causing duodenal obstruction. In duodenal stenosis, there is partial narrowing (stenosis) of the deudenal lumen. It is associated with variable and delayed manifestations, followed by concealed symptoms at the beginning, and may last up to adulthood. The exact etiology of duodenal atresia is not known as the most cases are sporadic. However, it is suggested that during the early weeks of gestation (6th and 7th week), the endodermal epithelium proliferates, and the portions of the gastrointestinal tract lumen become occluded. The recanalization normally occurs during 8 – 10 weeks of gestation, and the lumen patency is restored. The failure to recanalize due to any reason results in atresia. One of the suggested reasons for the recanalization failure is hypoxia of the fetus during the early stages of embryogenesis (ischemic episode). Duodenal atresia is a relatively common congenital anomaly of the gastrointestinal tract occurring in 1 in 2,500-40,000 live births. The one-third of these cases are associated with Down syndrome (trisomy 21). There is no racial or gender propensity, with equal incidence in both males and females. In 85% of the cases of complete duodenal atresia, bilious vomiting occurs during the first hours of life. The color of the vomitus is yellowish-green, sometimes with brown granular matter. In the rest of the cases (15%), the vomiting may be non-bilious as the atresia occurs proximal to the ampulla of Vater. On physical examination, the abdomen is sunken (scaphoid abdomen). 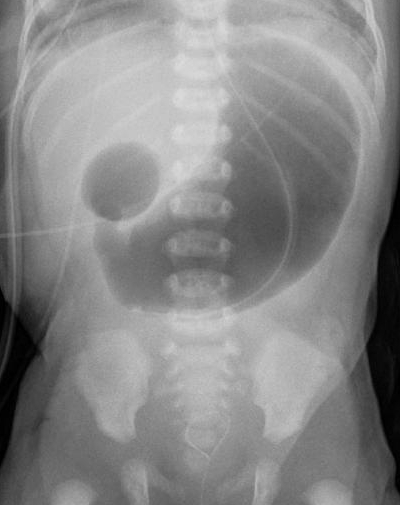 There may be epigastric fullness due to distension of the stomach and proximal duodenum. 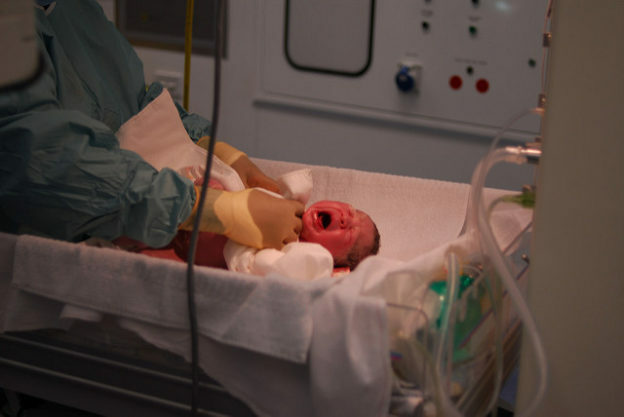 Although the bowel movements are absent due to high intestinal blockage, the meconium passage is not affected during the first 24 hours after birth. The affected newborn may be small for his/her gestational age. Jejunoileal atresia, during the first hours of birth, abdominal distention. Partial duodenal atresia (stenosis) symptoms depend on the severity of the defect. The illness may not show any symptoms for months or even years and usually manifests with long-lasting vomiting, constipation, food aspiration and failure to thrive. The constipation is unresponsive to treatment. Radiography is an informative method of examination in duodenal atresia. It finds the dilated stomach and the first part of the duodenum (“double bubble”) and the absence of air behind the second bubble. 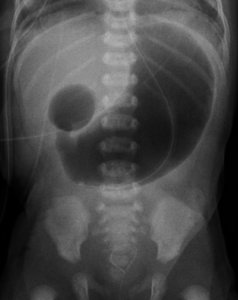 This finding of a double bubble sign with no distal gas strongly suggests duodenal atresia. 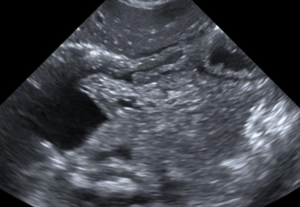 Ultrasonography is efficient in the prenatal diagnosis of duodenal atresia, apart from the specific appearance of the abdomen; there is polyhydramnios, which is a prominent symptom of the defect. Ultrasonography is preferred in esophageal and duodenal atresia. Barium enema examination is an additional study that makes distant duodenal atresia, as well as malpositioned cecum, evident. However, in the diagnostics of malrotation and volvulus, barium enema is not that informative. No laboratory studies are diagnostic of duodenal atresia. However, laboratory studies help in the assessment of the infant’s overall clinical condition. Blood glucose may be low in premature babies; they tend to develop hypoglycemia as there is a limited supply of glycogen. Serum electrolytes have to be determined as infants with duodenal atresia tend to lose fluids and electrolytes produced by the stomach, due to a large amount of gastric aspiration. Karyotype analysis is the appropriate method of examination in the case of trisomy 21. Immunohistochemistry of proximal and distal duodenal samples of affected infants reflects changes and transformation of neuronal cells, intestinal cell Cajai, hypertrophy of circular muscles. All of these witness about the persistent disorder of the duodenal movement after primary surgery. Measurement of gastric aspiration. Normally, it should not exceed 5 ml. Duodenal atresia is suspected when an infant’s gastric aspiration is greater than 30 ml. The fullness of the epigastrium may be detected manually and visually when the food gets stacked above the narrowed lumen. Rectal biopsy conducted in order to exclude Hirschsprung disease, especially in patients with Down syndrome. Hematocrit has to be checked prior to general anesthesia. Arterial blood gas measurements are needed if the infant has aspirated or shows signs of respiratory distress. There is no conservative treatment available for this condition.